Montana consists of many rivers like Red Rock River, Flathead River, Gallatin River, Musselshell River, Judith River and many more. These rivers flow through many places in Montana. Missouri River, Yellowstone River, Beaverhead River, Big Hole River, Big Horn River, Big Muddy Creek, Bitterroot River, Blackfoot Rriver, Clark Fork, Clarks Fork, Flathead River, Gallatin River, Jefferson River, Judith River, Kootenai River, Little Missouri River, Little Bighorn River, Madison River, Marias River, Milk River, Musselshell River, O'Fallon Creek, Poplar River, Powder River, Red Rock River, Rosebud Creek, Redwater River, St. Regis River, Swan River, South Fork Flathead River, Sun River, Teton River, Tongue River. 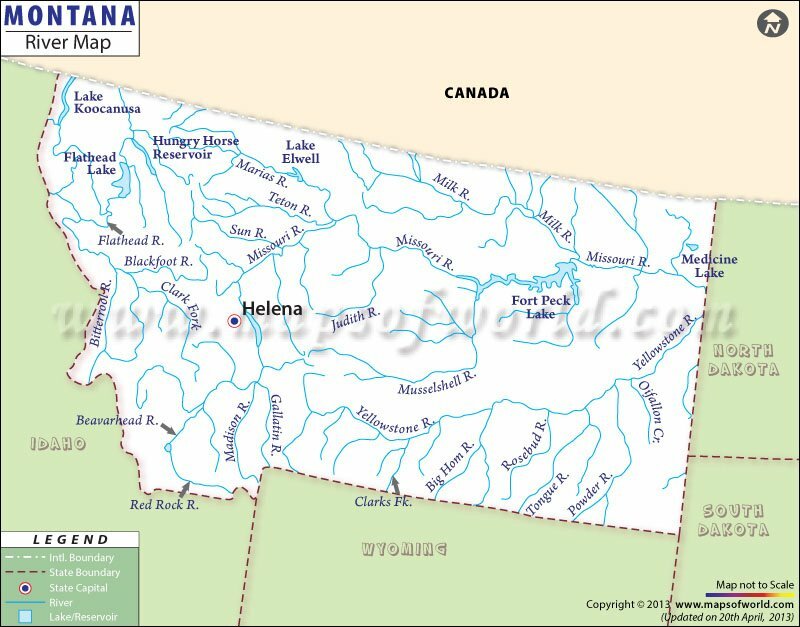 The Montana River Map highlights the several rivers and lakes of the state. Several rivers and lakes flow through the State of Montana. Montana’s three most prominent rivers are the Clark Fork River, the Yellowstone River and the Missouri River. Flowing out from the Yellowstone National Park, the Yellowstone River converges with great Missouri River in North Dakota, whereas the Missouri River flows across Three Fork. In the southwestern part of Montana, the Clark Fork River originates at the junction of Warm Springs Creek and Silver Bow Creek and then drains into the Warm Springs Wildlife Management Area. A few of the important rivers of the northwestern part of Montana are Swan, Whitefish and Kootenai. The southern edge of the state includes rivers such as the Rock River, the Boulder River and the Stillwater River, while the Flint Creek, the Ruby and the Beaverhead are some of the notable rivers of southwestern Montana, and in Central Montana, the famous rivers are the Smith, the Marias and the Sun. In addition, Flathead Lake and Fort Peck Lake are two important lakes in Montana: covering a total area of 375 sq miles, Ft. Peck Reservoir is one the biggest inland bodies of water in the Northern US. Canyon Ferry Lake, Flathead Lake, Fort Peck Lake, Fresno Reservoir, Hebgen Lake, Hungry Horse Reservoir, Lake Elwell, Lake Kooca, Medicine Lake and Nelson Reservoir.